Important! Besides price categories, you can also configure Discount Prices. Note The price categories list is sorted by priority from low to high, so when price adjustment is set for more than one price category, the price category with the highest priority is used. 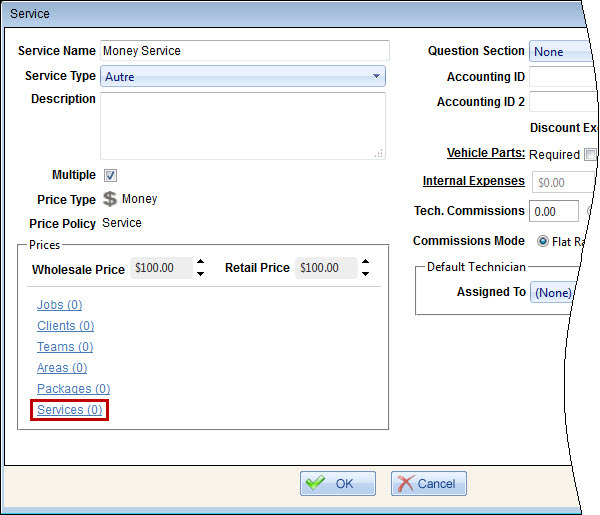 Tip You can create multiple prices with different effective dates within each category. For example, if you want service price to be automatically changed for each season, you can define appropriate prices and dates when these prices become effective. In the Service dialog box, in the Prices section, click the Services link to set service price adjustment matrix for standard price (or any other link in the section depending on the type of service price adjustment matrix that you want to set). Enter the appropriate price in the Wholesale Price box and, if applicable, the Retail Price box, select the appropriate date in the Effective Date box, and then click Add. Add as many prices for different effective dates as you need, and then click Save Prices. 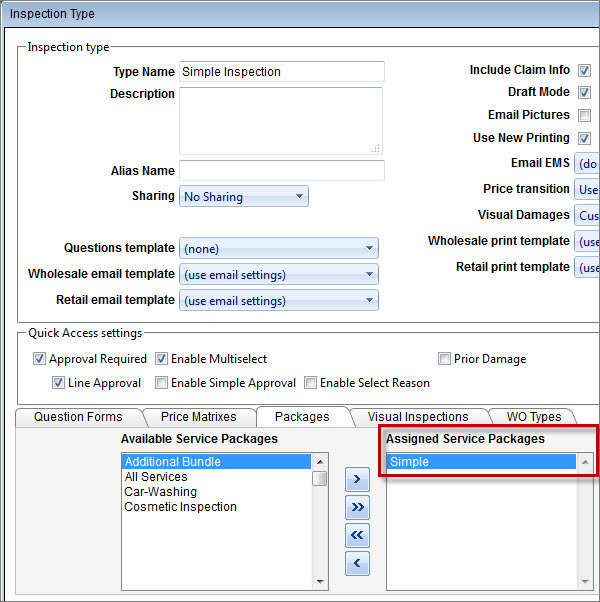 You can set a different service price for wholesale clients and retail clients, so that when you add a service to an inspection or a work order, service price can be automatically adjusted depending on the customer type. On the Company tab, click Services, and then on the Services page, click Edit next to the appropriate service. In the Service dialog box, enter price in the Wholesale Price box and the Retail Price box, and then click OK. 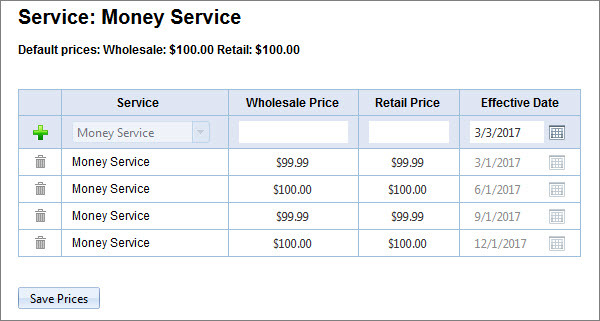 Note You can set wholesale and retail price adjustment by clicking the Services link in the Prices section. On the Company tab, click Service Packages, and then on the Service Packages page, click the Services link next to the appropriate service package. In the Package Item dialog box, enter price in the Package Price box, and click OK.
...but you can assign only one service package and only while creating a work order type. Note You can also set package price directly in the service profile by clicking the Packages link in the Prices section. On the Company tab, click Areas, and then click the Service Prices link next to the appropriate area. On the Company tab, click Teams, and then click the Service Prices link next to the appropriate team. If needed, add as many different team prices for different effective dates as you want, and then click Save Prices. Note You can also set team price directly in the service profile by clicking the Teams link in the Prices section. On the Company tab, click Clients, and then on the Clients page, click the Services link next to the appropriate client. Note The Services link is available only for wholesale clients. On the Client Services page, click the appropriate package in the Service Package box, and then click Edit next to the appropriate service. Note If the same service is added to multiple service packages, you can set a different client price for different service packages. 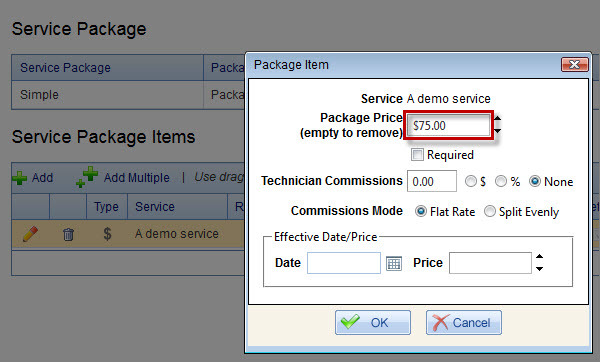 In the Client Service dialog box, enter price in the Client Price box, and click OK. 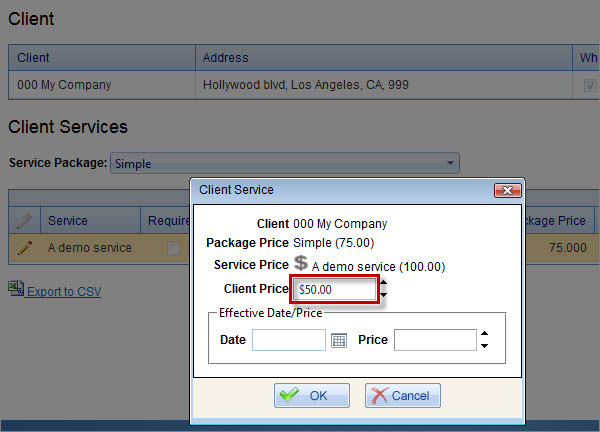 Note You can also set client price directly in the service profile by clicking the Clients link in the Prices section. On the Company tab, click Jobs, and then click Add on the toolbar, enter job settings, and click OK.
On the Company tab, click Work Order Types, and then click the Jobs link next to the appropriate work order type. 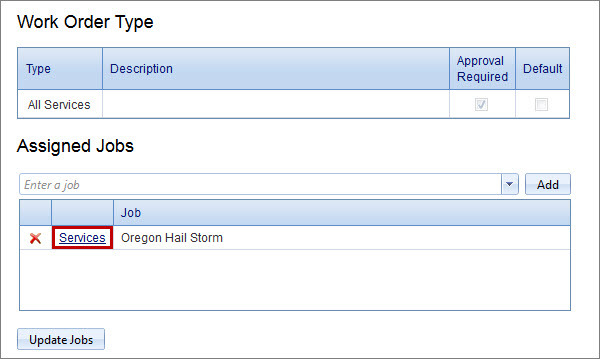 On the Assigned Jobs page, click the appropriate job, click Add, click Update Jobs, and then click the Services link. On the Services page, enter job price for the appropriate services, and then click Update Services. Note You can also set job price directly in the service profile by clicking the Jobs link in the Prices section. You can set a service discount, so that when you add a service to an inspection or a work order, service price can be automatically adjusted depending on the discount rate. On the Company tab, click Services, and then on the Services page, click Manage Discounts/Fees on the toolbar. On the Discounts/Fees pages, click the Services link next to the appropriate discount. Click the appropriate service in the Services box, click the right-pointing arrow to move the selected service to the Discount / Fee Services box, enter discount rate in the Wholesale column and the Retail column, and then click Update. Note The discount can be applicable for all clients or a particular client that you can select in the Client box.